In November of 2015, the Centers for Disease Control and Prevention released a statement that stated that the potentially deadly insect commonly referred to as the “Kissing Bug” had officially been identified and reported into more than half of the entire United States. These insects most commonly feed on the blood of mammals – including both humans and their pets. The bug bites mammals in the lip region of the face. In many instances, the insect is infected with dangerous parasites and may even engage in the act of defecating in the wound that they have created. If this happens, the mammal that was the target of the bug’s “kiss” could develop Chagas disease. This could prove to be fatal if the infected mammal is not treated. All Pest Exterminating, Inc. has the ability to protect you, your loved ones, and your home from the “kissing bug”. 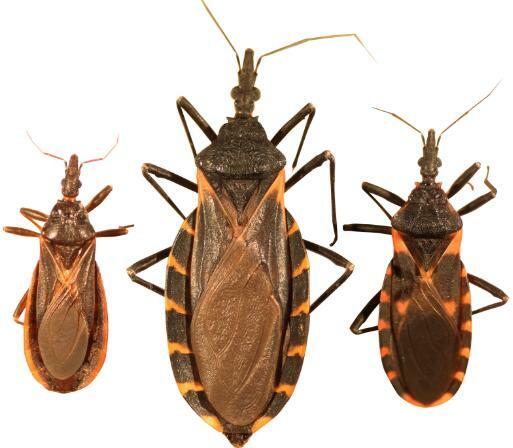 If the “kissing bug” invades your home, they will opt to hide in locations such as cracks, in mattresses, and underneath beds. Once night time has arrived, these insects will crawl out of their hiding spots. Given the nature of where the insects hide, when they come out, they will nearly always run into a person or a pet. In the past, these insects caused the largest amount of damage and concern in Latin America. This is because the area has a tremendous amount of substandard housing and the bugs nest in the cracks of those homes. According to statistics, approximately 8 million people within Mexico, South America, and Central America have contracted Chagas disease. In the United States, approximately 10% of all dogs in shelters located in Southern Texas have contracted Chagas. All gaps in and around the home should be completely sealed. These include those that are near windows, roofs, walls, screens, and doors. If your pet has their own bed, it should be treated for the “kissing bug” and you should consistently check to ensure that the insect has not invaded the bedding. If you have brush, wood, or piles of rocks near your home, they should be removed to prevent an infestation. At night, all outdoor lights should be turned off when they are not absolutely necessary. These lights are known to attract the “kissing bug”. It is a known fact that the “kissing bug” is difficult to kill. In fact, most of the standard over-the-counter pesticides do not work. In November of 2015, residents of Indiana were told to trap the insect in a jar and either drown it by pouring rubbing alcohol into the jar or freeze it by pouring water into the jar and placing it in a freezer. While these methods are still considered to be effective, the best solution is to allow us –All Pest Exterminating – to come and treat your home using our specially-blended pesticide formulas.